Service-learning courses use service projects for local community organizations as a primary teaching method. Service-learning courses are specifically designed to integrate the academic course content into real, impactful projects that not only meet the learning objectives of the course, but will provide genuine value to the community as well. As a service-learning student you will work with a community partner organization to develop a project or provide a service that meets a need within the community, and then reflect back on the experience and its impact on you and the community you have helped serve. You can obtain a Pennsylvania State Police Criminal Record Check online. There is no cost for the application for volunteers. The majority of clean record checks will be displayed immediately. If your record is sent for review or is returned with entries, please allow up to 4-6 weeks for your record to be made available to you. Click here to obtain a PA State Police Criminal Record Check. No Record: If this status is assigned to the request it is the user's responsibility to double click on the control number. This will take the user to the details screen where the user will double click on the blue hyper link, "Certification Form", near the center of the page. By clicking on "Certification Form", a certified no record form will be displayed in PDF format. No Record: Follow the instructions above for a no record response. Record: Indicates the person has a record and a record response has been mailed to the address provided. Pending: This status is occasionally assigned when traffic is extremely heavy and requires the user to check back at a later time. A request should not remain in pending status for more than 24 hours. If a request remains in pending status for more than 24 hours call the PATCH Help Line toll-free at 1-888-QUERY-PA (1-888-783-7972). You should print at least one copy of your certificate. We recommend printing several so that you have them. Save a copy of your pdf form for future reference. To check your record status and print additional copies of your clearance, visit this page and click Check the status of a Record Check. You can obtain a Pennsylvania Child Abuse History Check online. The cost of the application is $8, which can be paid by credit/debit card. Please allow at least 4-6 weeks for your child abuse history check to be made available to you. Click here to obtain a PA Child Abuse History Check. Click on Create Individual Account, then click Next on the next screen. You will receive a confirmation email, followed by a notification email once your application has been reviewed. This process can take up to 4-6 weeks. Once you receive notification your certificate is available, log back in to print and save your certificate. These instructions are for service-learning clearances only. If you require FBI fingerprint clearances for other purposes, please check with your department. Some agencies require student volunteers to get an FBI fingerprint check, particularly if you reside out of state. The cost of the fingerprinting is $25.75 through the Department of Human Services. You will need to make your fingerprinting appointment and payment online, then take your receipt and ID along to a fingerprinting location to be fingerprinted. Please allow 4-6 weeks for your results to be mailed to you. Click here to register online for fingerprinting. Enter the service code 1KG6ZJ. This is the service code for 'Pennsylvania - DHS Volunteer'. Click Schedule or manage appointment. Complete the registration and payment online, and schedule your fingerprint appointment at your nearest Identogo location. 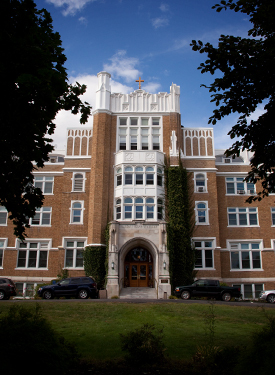 The nearest location to Misericordia University is the Kingston location. Print a copy of your receipt – you will need to take this with you to the fingerprinting location. You will need to take your receipt and your Driver’s License or State ID with you to your chosen fingerprinting location. Our nearest location is listed below. Your results will be mailed to you in 2-3 weeks. Use the Wilkes-Barre exit to Route 309 North. Take 309 North to exit 3 (Plains exit). At the bottom of the exit ramp turn left onto River Street. Travel 2 miles toward the City of Wilkes-Barre. Turn right onto Pierce Street and travel 1.5 miles to Tioga Avenue. Turn left on Tioga Avenue and the Luzerne Intermediate Unit is on the right side. Use Route 309 South towards Wilkes-Barre. Take exit 3 (Plains exit). Turn Right onto River Street. Travel 2 miles toward the City of Wilkes-Barre. Turn right onto Pierce Street and travel 1.5 miles to Tioga Avenue. Turn left on Tioga Avenue and the Luzerne Intermediate Unit is on the right side. If your service-learning site requires immunization documentation or TB verification, most community partners will accept the health assessment that is completed when enrolling at Misericordia. If you didn’t keep a copy of your health assessment before submitting it to the Health Center, please contact the Health Center who will be able to provide you with a copy. Please note: TB verification must be within one year of your volunteer service start date. The Health and Wellness Center offers both single step and two step PPD/TB testing during the academic calendar. Please contact the Health and Wellness Center for more information.